I Buy Way Too Many Records Dot Com: A Giant Dog - Creep 7"
You guys know how much I love singles clubs. Pay a bunch of money up front and then receive a record every month or so. Some good, some bad, but always a fun time. Windian Records takes a slightly different slant on the idea. Rather than spread the records out over a several month period, they drop all five records in your lap on the same day, and they give you a fancy box set to boot. It's a different take on the concept and I'll admit it's a pretty great looking set. Plus, unlike other clubs, Windian actually lets you buy individual singles from the set if you want. Though I don't know why anyone wouldn't want to grab all of them right away. 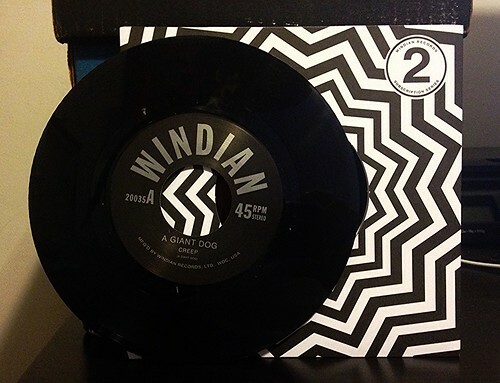 This first 7" in the 2014 club is by A Giant Dog. Having really enjoyed their pink album from a few years ago, I was pretty excited to hear some new songs and the two on this record didn't let me down. Fun, hooky and absolutely bursting with energy. They have such powerful vocals and the way they interplay with the huge guitar and driving rhythm section is something to behold. Both songs are every bit as good as anything on their last full length. My only complaint is that it just leaves me wanting more. I hope they're hard at work on another full length because I will absolutely be buying that on day one.